What OBD2 interface are you guys using for the Palmer Performance app? I highly recomend the Palmer Performance app over Torque. Interface is better and Ive found it easier to customize. 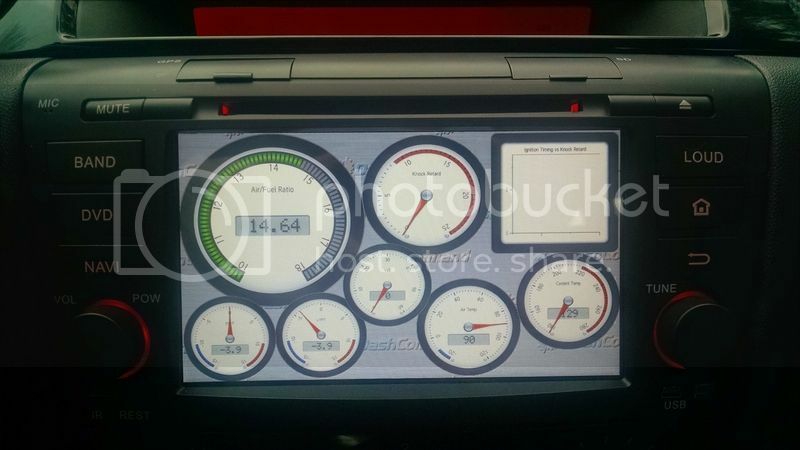 I jumped on their forums and asked for some custom PIDs (knock related) for my Mazda and within a couple days they included it in the update. Here is my set up. Its an in dash Android. Im using it along with a ScanTools OBDLink MX Bluetooth adapter. AFR, Short Term Fuel Trims, Long Term Fuel Trims, Intake Temp, Coolant Temp, Timing vs Knock Retard vs EGR duty histograph, Knock Retard, middle is VVT. Its a much cleaner layout now and I included a volt meter and spent some time on the min/max colors and gauge types. Been playing with the Fuel Consumption dashboard lately and trying to get above 35 avg. This morning was 31.9 and Im still on snows along with no EGR duty.